Trompe l’oeil, meaning ‘fool the eye,’ is a term traditionally applied to paintings exhibiting such photographic detail as to make the viewer believe they are actually seeing the object(s) depicted. When used to describe these late nineteenth-century works of Russian silver, the term refers to the way these pieces simulate birch bark wood. Objects decorated to look like wood were quite popular in Russia in the second half of the nineteenth-century, as craftsmen sought to mimic the “bast” shoes made of woven birch bark worn by the peasants. Romanticizing the peasantry is a frequently occurring theme in the arts, particularly the nineteenth-century. This especially rang true in Russia following Alexander II’s emancipation of the serfs in 1861. Suddenly there was tremendous interest in the music, arts and crafts, and daily life of the serfs. A yearning for a Russian art unmarred by Western influence contributed to what became the Russian Revival in the 1870s and 1880s. In addition to studies of serf life, there was also an interest in exploring earlier Russian artistic traditions, providing craftsmen a rich body of sources for creating beautiful, distinctly Russian works of art. Trompe l’oeil was an international trend, being also in fashion in America during this period and produced by notable firms like Gorham and Tiffany. 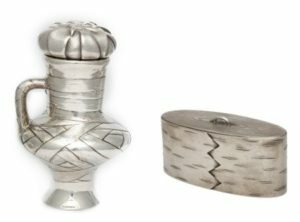 However, this 1871 birch box and 1882 milk jug, coupled with a number of other exceptional pieces, leave no one fooled as to the mastery of this genre.